Since forming in Gainesville, Florida in 1992, ska punk quintet Less Than Jake have released eight studio albums, eight EPs, five live albums and five compilations. To date, they’ve sold over 1.5 million records worldwide. Their fan base is perhaps largest in the UK, where their mix of traditional, rhythmic ska, fast, melodic punk rock, vocal harmonies and heartfelt lyrics truly connected with a mass audience during the third-wave ska revival of the mid-90s. Team Rock caught up with the band whilst they were on tour in the UK to promote their latest release, Live From Astoria, recorded at the much missed London venue during the band’s 2001 UK tour, and we set bassist/vocalist, songwriter and occasional producer Roger Lima the task of ranking their studio albums in order of personal preference. 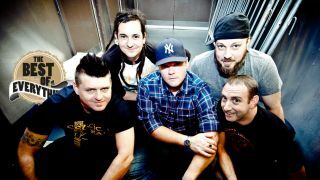 Less Than Jake will release Live From Astoria on April 29 via Rude / Saint November. The band will headline the Fireball - Fuelling The Fire tour in October.